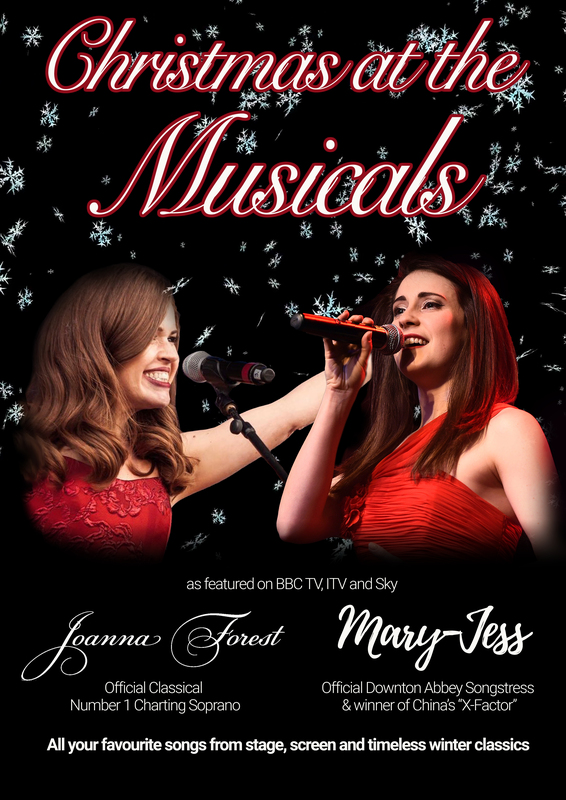 Join Mary-Jess (winner of the Chinese ‘X Factor’ and Official Downton Abbey Songstress) and Joanna Forest (the first independent soprano to achieve UK Classical Number 1 with her debut album) and their special guests Castle School Choir at the Creative Innovation Centre CIC in Taunton for a magical festive evening! They’ll sing all your favourites from stage and screen along with timeless winter classics to really get you in to the Christmas spirit! VIP tickets are available on a first come first served basis and include a pre-show Meet & Greet with Mary-Jess and Joanna Forest at 6.30pm, light refreshments during the Meet & Greet and the front two rows of seating for the concert will be reserved exclusively for VIP ticket holders too. Vanessa H: A beautiful voice which had everyone riveted. Suzy: Joanna is an outstanding singer. Robert Scullen: Joanna Forest is the complete performer. With her extraordinary beauty, stage presence and natural charm you have an artist that will put on a show that the audience or your guests will be talking about for years to come. Lee Austin: I went to a Christmas show last year, as I really wanted to hear that beautiful voice live. I can say for sure the voice is outstanding echoing through a church, her range is amazing to sit and watch and to listen to Mary is a joy not to miss. But she is also a beautiful person to meet and talk to that makes the night. If you can get to a show do so for sure. Sandor Lubisch: I travelled from the USA to England to see Mary-Jess perform at one of her holiday shows. She has a stunning singing voice and sounds even better in person. Her live performances should not be missed. Matt Burney: I was so impressed with Mary-Jess that I decided to invite her to sing in front of lots of VIPs including HRH Prince William when we held a major Festival of Creativity in Shanghai in 2015. She was so amazing we extended another invitation to sing for the British Chamber of Commerce in China in front of around 1,000 business leaders. She is superb and has the warmest personality of any performer I have ever encountered. Just enchanting! Nigel Davis: If you have the chance to go to see & hear Mary-Jess in concert then I'd highly recommend it!! I've been fortunate to see & meet her several times & every time is a joy. From her initial song 'Glorious' from her 1st CD to her most recent collaboration CD 'Inspire' her talent is obvious. Mary-Jess has a beautiful voice that she displays in her repertoire of classical & contemporary songs. She is excellent in concert on her own or supporting others, such as G4, & is also very keen to support young & up & coming artists, having scaled those heights herself!! Do go & see her in concert, you will certainly NOT REGRET IT!!! © 2019 Ticketbooth Europe on behalf of Shine Music Ent. All sales are final. Tickets are non-refundable.